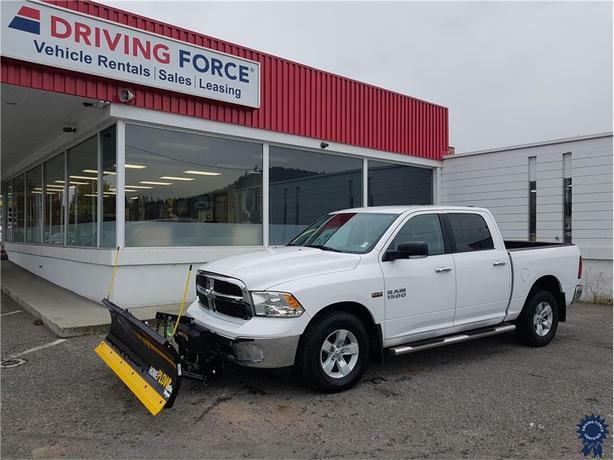 This 2016 Ram 1500 SLT Crew Cab 6 Passenger 4X4 5.6-Foot Short Box Truck comes with a 6.8-Foot wide Meyer Home Plow, 8-speed TorqueFlite automatic transmission, electronic transfer case, 3.92 rear axle ratio, 17-inch wheels, cloth front 40/20/40 split bench seat, remote start, anti-spin differential rear axle, Class IV trailer hitch receiver, spray-in bedliner, fog lamps, Uconnect 8.4-inch SiriusXM/Hands-Free system, ParkView rear backup camera, HD shock absorbers, auto locking hubs, deep tinted glass, tip start, chrome grille, manual tilt steering column, two 12V DC power outlets, Bluetooth hands-free calling, tire specific low tire pressure warning system, platform running boards, 121-litre fuel tank, 1,300 lbs Maximum Payload and GVWR rating of 6,900 lbs (3,129 kgs). The 5.7-litre Hemi V8 gas engine provides 395 horsepower at 5,600 RPM and 410 lb-ft of torque at 3,950 RPM. Touch base with us to discuss purchasing or financing options that are right for you and experience the difference you will only find at DRIVING FORCE Vehicle Rentals, Sales and Leasing.